Toronto, Canada, January 11, 2017 – Nevada Zinc Corporation (“Nevada Zinc” or the “Company”) (TSX-V: NZN) is pleased to report drill hole assay results for the first 9 drill holes from its Phase 5 drill program at the Company’s Lone Mountain project(the “Project”). The Company has successfully completed its Phase 5 program which included a total of 24 drill holes, completion of additional surface geological mapping and prospecting, completion of some limited geophysical test work and also completion of some additional specific gravity testing of mineralized material. The Company anticipates receipt of assay results for the remaining 15 drill holes over the course of this month. Drill hole LM 16-71 intersected significant high grade zinc-lead mineralizationover a 22.86 metre interval from 88 metres downhole grading 17.49% zinc and 1.23% lead (18.72% zinc+lead) southwest of the historic mine workings on the Moutain View Mine property. Drill holes LM-16-63, 64, and 65 extend the Discovery zone mineralization down dip in a north to northeasterly direction. Drill hole LM-16-64 intersected a broad zone of zinc mineralization from 184.4 metres downhole that averaged 3.99% zinc and 0.21% lead over 53.34 metres, including a 30.48 metre interval that averaged 5.99% zinc. The Discovery zone zinc mineralization remains untested at depth to the northeast beyond holes LM-16-63, 64 and 65. All zinc and lead mineralization intersected to date on the Project is non-sulphide type mineralization (important in that the mineralization is not a mixture of sulphide and non-sulphide which would complicate the extractive metallurgy process). Supervision and organization of reverse circulation drilling chip samples was undertaken by Company personnel. Samples were collected at 5-ft intervals from a rotating wet splitter assembly attached to the drill rig. Chip tray samples were collected from the reject side of the wet splitter. The splitter was adjusted to produce 10-20 lbs of sample. Samples were collected from the drill in cloth bags by employees of New Frontier Drilling under the supervision of Company personnel. Samples were catalogued by Nevada Zinc geologists and stored in a secure location. Certified reference standards were placed in the sample stream of each drill hole at random intervals. Blank material was also inserted at random intervals. Quality control samples from the lab include numerous control blanks, duplicates and standards. Reference standards used include OREAS-133b, OREAS-134b, OGGeo08, and CZN-4. No issues were noted with analytical accuracy or precision. Bruce Durham P.Geo, President and CEO of Nevada Zinc, is a Qualified Person, as that term is defined by Canadian regulatory guidelines under National Instrument 43-101, and has read and approved the technical information contained in this press release. While the Company maintains its highly prospective Yukon gold properties and continues to advance them, the current focus of the Company is the exploration and advancement of the highly prospective Lone Mountain zinc project comprised of 224 claims covering approximately 4,000 acres near Eureka, Nevada. The Lone Mountain Project is located in east-central Nevada and is easily accessible via paved and gravel roads northwesterly from Eureka where all essential services are available. The Project includes options, leasesor purchase agreements to acquire 100% interests in all properties along the key structural trend for more than 4 kilometres. Nevada Zinc is a discovery driven mineral exploration company with a proven management team focussed on identifying unique mineral exploration opportunities that can provide significant value to its shareholders. The Company’s existing zinc and gold projects are located in Nevada and Yukon, respectively. Toronto, Ontario--(Newsfile Corp. - December 20, 2016) - Nevada Zinc Corporation (TSXV: NZN) ("Nevada Zinc" or the "Company") is pleased to report it has outlined a significant gold exploration target on the Company's Goodman Project located immediately southwest of Victoria Gold Corporation's Eagle Gold Project. As well, the Company is continuing to drill on its Lone Mountain Zinc Project in Nevada where the most recently completed Phase 4 drill program intersected significant intervals of very near surface high grade zinc mineralization including holes that collared in sub-cropping mineralization assaying up to 5.76% zinc over 41.15 metres (press release August 11, 2016). President and CEO, Bruce Durham commented; "we continue to drill at our highly prospective Lone Mountain Zinc Project in Nevada and we are pleased to report continuing positive exploration progress on our extensive land holdings in Yukon. 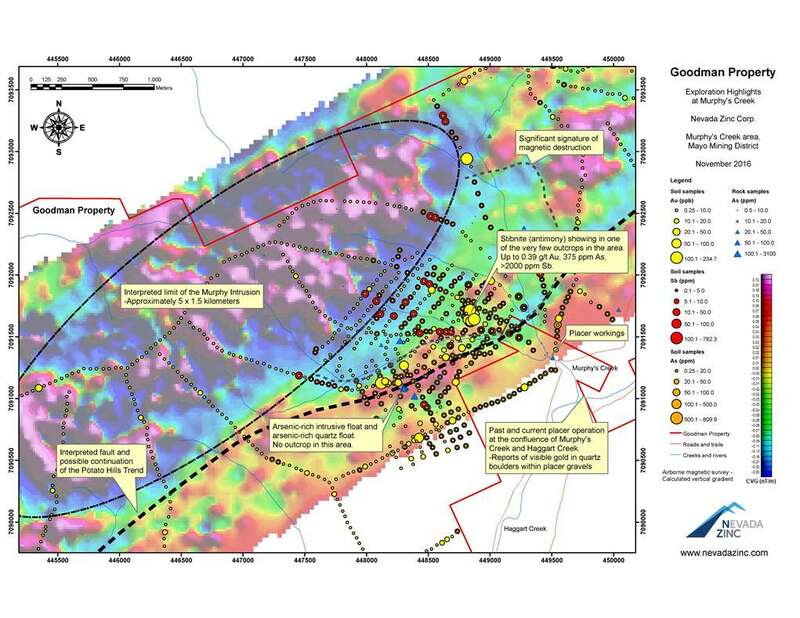 We own a 100% interest in the Goodman Project which covers more than 20 kilometres along the extension of Victoria Gold's Potato Hills Trend and where our work over the past 6 years has now clearly outlined a number of geochemical and geophysical targets very similar to those found at Victoria Gold's Eagle Gold Project. There is room for an entire gold camp on our Goodman Project and it is only one of several large land package, high quality gold projects we continue to advance in Yukon. With Goldcorp Inc. and Agnico Eagle Mines Limited each committing to significant projects in Yukon, the territory appears to be garnering significant interest as a prime destination for exploration dollars ". A recent airborne magnetic survey completed by Precision GeoSurveys Inc. for the Company clearly outlines a 5 kilometre by 1.5 kilometre elongate felsic intrusion (termed the Murphy Intrusion) that trends roughly 70 degrees parallel to stratigraphy. The host felsic intrusion at Victoria Gold's Eagle Gold Deposit is similarly indicated to be 5 kilometres by 1.5 kilometres and trends roughly 60 degrees parallel to stratigraphy (See accompanying figure 1). An extensive, prominent magnetic low in the airborne magnetic data along the southeast margin of the Murphy Intrusion appears to reflect the presence of an extensive zone of magnetic relief destruction. Such zones are often determined to result from strong alteration that alter and destroy magnetic minerals such as magnetite and pyrrhotite and may also reflect the presence of significant gold mineralizing fluids. A well-defined magnetic low feature extends along the southeast margin of the interpreted intrusion and beyond in a north-easterly direction. The trend of the magnetic low feature is similar to and may be related to the extension of Victoria Gold's Potato Hills Trend. This feature extends for 7 kilometres in the area where the magnetic data was collected and the interpreted fault may extend farther. The area of strongest geochemical anomalies in the area of magnetic destruction southeast of the contact of the newly defined intrusive stretches for more than 1,000 metres and many stations are anomalous in gold, arsenic, silver, antimony and variably lead and zinc. The magnetic low along the southeast margin of the intrusion correlates very well with the location of numerous geochemical samples that contain variably anomalous gold, arsenic, antimony and silver. This suite of anomalous elements is very similar to the suite of elements reported at Victoria Gold's Eagle Gold Deposit and other mineralized locations in the area (See accompanying figure 2). While outcrop in the area of anomalous geochemistry and magnetic signal destruction is very scarce, one outcrop of highly altered schist was located that contained coarse visible stibnite (antimony mineral) and assayed up to 390 ppb gold. The sample contained 2,000 ppm antimony. In the same area several arsenic rich intrusive and quartz rich boulders were located although no outcrop of the material was found. The Company plans to carry out additional exploration work on the Murphy target in 2017. The main body of claims that comprise the Goodman Property were acquired by the Company in 2010. Additional claims were acquired by the Company that effectively wrapped around the southwest corner of Victoria Gold's Eagle Gold Project land package and even includes four claims within the Eagle Gold Project in close proximity to the historic Peso adit that was driven to investigate the high grade silver lead antimony Peso vein system. A hole completed by Victoria Gold near the Company's four claim property boundary in 2011 returned assays of 166.55g/t silver, 2.27% lead, 1.7% antimony and 0.34% zinc over a length of 7.74 metres. In the same program a hole between the Eagle Gold Deposit and the newly identified Murphy Intrusion on the Potato Hills Trend assayed 382.1 g/t silver over 27.44 metres in the historic Rex area. The Eagle Gold Deposit which hosts resources of 4.8 million ounces of gold in indicated resources and 1.5 million ounces of gold in inferred resources is an intrusion related gold system with the majority of the gold mineralization hosted within a 94 million year old granodiorite measuring roughly 5 kilometres by 1.5 kilometres. The Eagle Gold Deposit is situated within the Potato Hills Trend, an open ended belt exhibiting anomalous gold, arsenic, bismuth and antimony as well as silver, lead and zinc that extends in a northeast southwest direction and which the Company interprets as passing through its Goodman Project. The Goodman Project was acquired as a large, completely untested gold exploration target covering the upstream location of a number of significant gold and pathfinder element anomalies located along the major regional trend and located immediately southwest of Victoria Gold's Eagle Gold Project. The Goodman Project also covers the upper reaches of at least 5 current or historic placer creeks for which there is no known source of the gold. The creeks are named Secret, Swede, Murphy, Goodman and Rodin. The Goodman Project is located at lower elevation than the Eagle Gold Project and much of the project has good road access, being located just north of the access road to the Eagle Gold Project. As a result much of the Goodman Project is covered with a veneer of overburden making definition of targets and mineralization more technically challenging and requiring more advanced techniques for exploration. Elsewhere on the Goodman Project, farther to the southwest the Company has outlined a number of "Keno Hill" style geochemical targets and gold targets that will be followed up. The Goodman Project is located 40 kilometres north-northwest of Mayo Yukon and is road accessible via the Silver Trail highway. The Goodman Project is located in the Tintina Gold Belt, a 2,000 kilometre gold district spanning Alaska and Yukon and which is known to host well over 100 million ounces of gold in many deposits including deposits such as Fort Knox, Donlin Creek, Pogo, Dublin Gulch, and Brewery Creek. The majority of these deposits are intrusion related gold deposits which formed between 70 and 105 million years ago . The Goodman Project is comprised of 379 mineral claims covering some 79 square kilometres and it covers 20 kilometres of favourable stratigraphy southwesterly along the projection of the Potato Hills Trend adjacent to the Victoria Gold Eagle Gold Project. No drilling or trenching has ever been undertaken on the Company's extensive Goodman land holdings other than excavations related to placer mining. The Company continues to be focused on its highly prospective Lone Mountain zinc exploration assets located in Nevada while concurrently allocating resources to its gold exploration targets in Yukon. In addition to its Goodman Project detailed above, the Company holds a large block of claims referred to as the VIP Project that covers the along trend extension of the gold and silver mineralization trends being actively explored by Goldcorp Inc. The Company also holds a significant land position at Josephine Creek where it holds both hardrock and placer rights along Josephine Creek adjacent to land held by Victoria Gold. As well, the Company holds the dominant land position in the Livingstone Creek placer gold district northeast of Whitehorse where its land position covers the upstream portion of several historic placer creeks that have produced some of the largest gold nuggets discovered in Yukon since the days of the original Yukon Gold Rush, with individual gold nuggets weighing up to more than 20 ounces. The Company has discovered significant gold in bedrock in its most recent work on the Livingstone property. Bruce Durham, P.Geo, is a qualified person, as that term is defined by National Instrument 43-101, and on behalf of the Company has approved the contents of this press release. Nevada Zinc is a discovery driven mineral exploration company with a proven management team focussed on identifying unique opportunities in mineral exploration that can provide significant value to its shareholders. The Company's existing zinc and gold projects are located in Nevada and Yukon, respectively. While the Company maintains its highly prospective Yukon gold properties and continues to advance them, the current focus of the Company is the exploration and advancement of the Lone Mountain Project comprised of 224 claims covering approximately 4,000 acres near Eureka, Nevada. The Lone Mountain Zinc Project is located in east-central Nevada and is easily accessible via paved and gravel roads northwesterly from Eureka where all essential services are available. The land that comprises the project includes options, leases or purchase agreements to acquire 100% interests in all properties along the key structural trend for more than four kilometres. Toronto, Canada, November 30, 2016 – Nevada Zinc Corporation (“Nevada Zinc” or the “Company”) (TSX-V: NZN) is pleased to report it has outlined a significant gold exploration target on its VIP Project located in Yukon, west of Goldcorp’s Coffee Gold Project. Goldcorpacquired ownership of the Coffee Gold Projecton July 19, 2016 for approximately $521 million by purchasing Kaminak Gold Corporation. Since the Kaminak transaction Goldcorp has acquired equity interests in two additional adjacent publicly traded property holders. 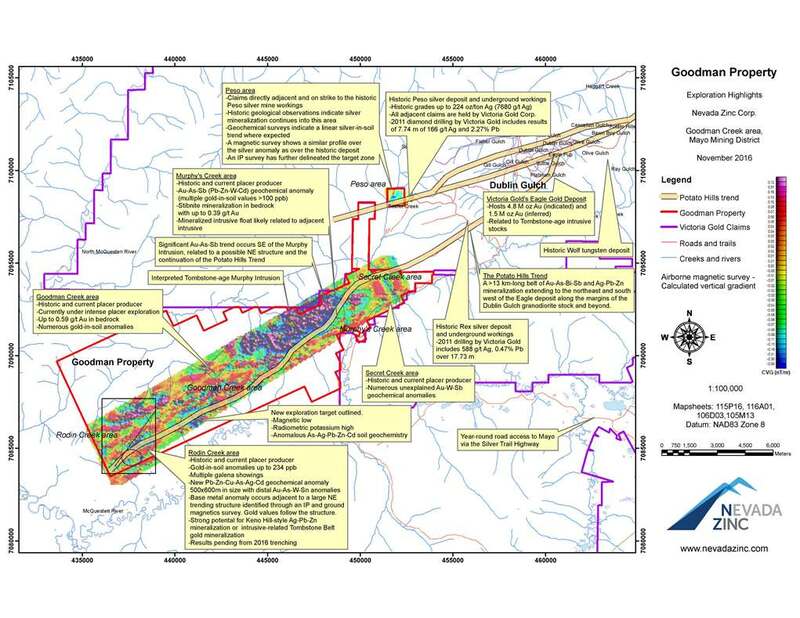 The 700 metre long East Big Creek gold target on the Company’s VIP Project remains open along strike and is unexplored for several kilometres along the trend of the existing anomalous data points. The Company is continuing to drill on its Lone Mountain zinc project in Nevada where the Company’s most recent drilling intersected significant intervals of very near surface high grade zinc mineralization including holes that collared in subrcopping mineralization assaying up to 5.76% zinc over 41.15 metres (press release August 11, 2016). President and CEO, Bruce Durham commented, “we are continuing to drill atour highly prospective Lone Mountain zinc project in Nevada and we are pleased to report continuing positive exploration progress on our large land holdings in Yukon. We own a 100% interest in more than 837 claims in the VIP area making us the only significant junior company in the area not involved with Goldcorp. Our expanded property position, with the addition of the Wolf block covers the westerly extension of our East Big Creek target for several kilometres where we have no exploration data. We have held the VIP property for more than six years and there are still large parts of the property that remain completely unexplored. There is room for an entire gold camp on our VIP Project and VIP is only one of several large land position, high quality gold projects we continue to advance in Yukon”. The East Big Creek target is comprised of a 700 metre long northwest trending gold-in-soil and pathfinder element geochemical anomaly that remains untested and open in both directions along strike. The anomaly is up to 250 metres wide, and is only constrained to the south (uphill) by permafrost which resulted in an inability to obtain proper sample material for analysis. Higher gold values in soil samples in the anomalous area range up to more than 10 times background which is highly anomalous for the area given the rather ubiquitous overburden cover. Anomalous gold values in soils correlates well with anomalous levels of tellurium, bismuth, sulphur, selenium, copper, silver, molybdenum, mercury, lead, antimony, and zinc. This suite of anomalous elements is a very good indicator for the presence of significant gold mineralization in the area. The East Big Creek target occurs within Klondike Schist of Paleozoic Age. It occurs 2.4 kilometres west-northwest on strike from a Cretaceous-age, Coffee Creek-phase monzogranite body, and 1.4 kilometres north of a Cretaceous, Whitehorse Suite gabbro body. The Coffee Creek-phase monzogranite body is one of a series continuing to the east-southeast and extending to the Coffee Creek Batholith which hosts a significant portion of Goldcorp’s Coffee Creek gold deposit. An airborne magnetic survey completed by Nevada Zinc in 2010 and recently reprocessed, indicates additional buried intrusions within 1 kilometre to the south of the East Big Creek anomaly and also to the northwest along trend of the East Big Creek anomaly. The location of these interpreted intrusions is on trend with the Coffee Creekintrusions. An extensive, prominent magnetic low in the reprocessed airborne magnetic data defines a northwest trending structure directly associated with the location of the East Big Creek target. Rock sampling in the area proved somewhat problematic due to lack of outcrop in the area of the defined target. Hand dug pits yielded grab samples with anomalous geochem results similar to the suite of anomalous elements found in the soil sampling data, indicating proximity to the source of the target. The Company plans to further evaluate the area of the East Big Creek target and also the extensions of the target both northwesterly and southeasterly in 2017. The VIP Project was acquired by the Company before the first announcement of the Coffee Creek drill results by Kaminak in 2010. The VIP Project was acquired as a very large, completely untested gold exploration target covering the upstream location of a number of significant gold and pathfinder element anomalies located along the major regional trend located immediately west of Goldcorp’s Coffee Gold Project. A transaction between Goldspike Exploration Inc. (now Nevada Zinc) and Silverquest (now Independence Gold Corp.) on some of the claims near the west boundary of the Coffee Gold Project resulted in the Company retaining a 1% net smelter returns (“NSR”) royalty on the YCS Property of Independence Gold Corp.
One item of particular interest just outside the Wolf claims on the VIP claims is the discovery of remnants of historic, never recorded, placer gold operations near the eastern boundary of the Wolf claims on the VIP block. The Company recently added significantly to its VIP land package by acquiring the 16 square kilometre Wolf claim group (64 claim units) locatedwithin the boundaries of the VIP Project. The recently acquired Wolf claims and the original VIP Project cover the interpreted sources of a number of high gold and multi-element geochemical targets similar to those found at the the Coffee Gold Project. Nevada Zinc has outlined a number of geochemical and structural targets that warrant further follow-up. The VIP Project is comprised of 837 mineral claims covering some 16,000 hectares covering 17 kilometres of favourable stratigraphy west of Goldcorp Coffee Gold Project. No drilling or trenching has ever been undertaken on the Company’s extensive VIP land holdings. The Company continues to be focused on its highly prospective Lone Mountain zinc exploration assets located in Nevada while concurrently allocating resources to its gold exploration targets in Yukon. In addition to its VIP Project the Company holds a large block of claims referred to as the Goodman Project that cover the southwesterly, along trend extension of the gold and silver mineralization trends being actively explored by Victoria Gold Corporation. The Company also holds a significant land position at Josephine Creek where it holds both hardrock and placer rights along Josephine Creek adjacent to land held by Victoria Gold. The Company also holds the dominant land position in the Livingstone Creek placer gold district northeast of Whitehorse where its land position was acquired to cover the upstream portion of several historic placer creeks that have produced some of the largest gold nuggets discovered in Yukon since the days of the original Yukon Gold Rush, with individual gold nuggets weighing up to more than 20 ounces. The Livingstone area, arguably the only placer gold district in Yukon for which a significant gold in bedrock source has not yet been located, was once a thriving community of more than 300 people and now sits as an abandoned village. The Company has in fact discovered significant gold in bedrock in its most recent work on the Livingstone property. Geochemistry of the nuggets and this new discovery of gold in bedrock by the Company appears to be part of the source for the extremely large nuggets that are still being found occasionally by the placer miners. Bruce Durham, P.Geo, is a qualified person, as that term is defined by National Instrument 43-101, and on behalf of the Company has approved the contents contained in this press release. The Lone Mountain zinc project is located in east-central Nevada and is easily accessible via paved and gravel roads northwesterly from Eureka where all essential services are available. The land that comprises the project includes options, leasesor purchase agreements to acquire 100% interests in all properties along the key structural trend for more than three kilometres. Toronto, Canada, October 20, 2016 – Nevada Zinc Corporation (“Nevada Zinc” or the “Company”) (TSX-V: NZN) is very pleased to announce that it will commence its Phase 5 drill program at the Company’s Lone Mountain zinc project (the “Project”) during the week of October 24, 2016. Nevada Zinc President and CEO, Bruce Durham commented, “We are excited to restart drilling after the success we had in our Phase 4 drill program. We will continue drilling for a good portion of the remainder of this year as we aggressively move forward our highly prospective and unique zinc project to determine the extent of the mineralization, the overall average grade of the mineralization and amenability of the mineralization to possess both low development costs and low operating costs in any eventual zinc production scenario. When we are not drilling on the Project we will continue to be active on a number of fronts as we advance our understanding of how to best optimize this very promising project for our shareholders”. The Phase 5 drill program will include a number of holes located at the discovery area where the last drill hole in that area, LM-16-56, assayed 6.99% zinc plus lead over a drill hole length of 100.58 metres/330 feet (press release August 11, 2016). Drilling will continue to be carried out in the vicinity of the historic Mountain View mine site where drill holes completed during the Company’s Phase 4 drill program, in the very shallow, near surface portion of that property, intersected strong zinc mineralization between surface and roughly 50 metres. Very shallow drill hole results at the Mountain View mine site include sub cropping mineralization grading 6.14% zinc plus lead over 41.15 metres starting at a hole depth of 3.05 metres (press release August 11, 2016). Drilling at the Mountain View mine site also included high grade, very shallow intervals such as 12.38% zinc plus lead over 12.19 metres at a depth of only 28.98 metres in drill hole LM-16-52 (press release July 27, 2016) and 15.64% zinc plus lead over 15.24 metres at a depth of 19.81 metres (press release July 5, 2016). The Phase 5 drill program will include the completion of 20 or more holes in the vicinity of the Mountain View mine site and the extensions of the mineralized zones intersected to-date in the discovery area near drill hole LM-16-56. Nevada Zinc is a discovery driven mineral exploration company with a proven management team focussed on identifying unique mineral exploration opportunitiesthat can provide significant value to its shareholders. The Company’s existing zinc and gold projects are located in Nevada and Yukon, respectively. In Yukon, the Company is finalizing work on its programs at Livingstone, VIP and Goodman. Results are pending on all three of these projects. While the Company maintains its highly prospective Yukon gold properties and continues to advance them, the current focus of the Company is the exploration and advancement of the highly prospective Lone Mountain zinc projectcomprised of 224 claims covering approximately 4,000 acres near Eureka, Nevada. The Lone Mountain project is located in east-central Nevada and is easily accessible via paved and gravel roads northwesterly from Eureka where all essential services are available. The Project includes options, leasesor purchase agreements to acquire 100% interests in all properties along the key structural trend for more than 3 kilometres. Toronto, Canada, October 6, 2016 – Nevada Zinc Corporation (“Nevada Zinc” or the “Company”) (TSX-V: NZN) is pleased to reportpositive developments in the area of the Company’s Livingstone gold project (“Livingstone Project”) where the Company believes it has outlined potential bedrock sources for the numerous large gold nuggets that have been recovered from local placer gold bearing creeks for more than 100 years. Five west draining creeks, four of which have their headwaters on the Company’s Livingstone Project, have produced some of the largest placer gold nuggets in Yukon since the original Klondike gold rush with individual gold nuggets weighing as much as 39 ounces. The Company recently acquired claims covering the headwaters of Little Violet Creek where 8 and 12 ounce gold nuggets were recovered in recent years. Mr. Durham added; “We would like to sincerely thank the Yukon government for undertaking the geophysical data collection work in the Livingstone area this year. The high quality data just released from that airborne survey will be of significant value to explorers for years to come”. The area covered by the Livingstone Project was expanded this season by more than 50% to the north of the original claim block and now extends for more than 10 kilometres along the favourable geological trend. The Livingstone Project now covers the upstream portions of the creeks where the large placer gold nuggets have been recovered. New property acquisitions in the northern part of the Livingstone Project include the headwaters of the Little Violet Creek placer gold operation. The placer miner on Little Violet Creek reported he discovered a 12 ounce and an 8 ounce gold nugget at his operation in the same day of sluicing in the most recent season of operation. Gold values up to 10 grams per tonne have been found in rubble and quartz carbonate galena pyrite mineralization in one bedrock exposure despite very limited outcrop exposure in the key part of the Livingstone Project and this gold-silver mineralized material corresponds directly to strong multi-element soil geochemical anomaliesas well as strong Induced Polarization geophysical anomalies, the latter of which have been shown to extend to the limit of the survey, a minimum distance of 800 metres. All five west draining creeks onthe expanded Livingstone Project have been mined for alluvial gold and government records indicate that each of the creeks has produced a high proportion ofcoarse placer gold nuggets with some weighing over 20 ounces and a high proportion of the recovered gold nuggets weighing more than 1 ounce. Thefive main creeks are named Livingstone, Lake, Summit, Cottoneva and Little Violet, the latter four being rather short, high energy creeks that drain from the Livingstone Project. While the Company has no interest in the placer operations in the area, recent developments in scientific work on the relationship between large placer gold nuggets and their bedrock source, as well as other new scientific initiatives, indicate the source of the extremely large nuggets to be quartz veins likely originating in the deformed bedrock on land held by the Company. East of the top of the north to northwest trending ridge on the Livingstone Project none of the east flowing creeks contain any appreciable gold, indicating the source of the large gold nuggets is likely west of the top of the ridge on the Livingstone Project. The Company holds the dominant land position in the area. Recent reprocessing of airborne magnetic data collected by the Company indicates the presence of well defined strong structural fabric in bedrock in the area that is interpreted to be related to the source area for some of the very large gold nuggets. Gold in bedrock and locally derived boulders have been shown to also be enriched in silver, lead, bismuth, antimony, arsenic and tellurium and mercury. Government sponsored scientific work on gold nuggets from creeks in the area determined that the gold nuggets in the area are similarly enriched in silver, lead, bismuth, antimony, arsenic, tellurium and mercury indicating a link between the nuggets and the bedrock gold discovery made by the Company . Government reports on placer mining in the area indicate that the upper reaches of one or more creeks showed an increase in angularity of the placer gold upstream toward the headwaters of the creek as well as a higher proportion of quartz being attached to the gold nuggets upstream , also pointing to a nearby further uphill source for the gold. Government reports indicate that at least 50,000 ounces of placer gold has been mined in the Livingstone area in the past 100 years and this number is thought to significantly under report actual production. The Yukon government recently released new airborne geophysical data covering an area well beyond and including the Company’s Livingstone Project. This data is being evaluated for its potential to contribute to the understanding of the geology and structural framework on the Livingstone Project and the surrounding area. Company personnel have just completed field work on theLivingstone Project and are currently in the field evaluating targets on the Company’s road accessible Goodman Project adjacent to and along trend with Victoria Gold’s Dublin Gulch gold project. The Livingstone Project is comprised of 156 claims covering an area of roughly 10 km by 4 km located 85km northeast of Whitehorse Yukon and is accessible via a winter road and also fixed wing aircraft to the Livingstone airstrip. Placer gold mining in the area spawnedthe town of Livingstone which had a population of at least 300 people in the early Klondike gold rush days. The Great Zinc Drought might be said to be broken, but those calling the end of this protracted dry spell going back to 2006 have been proven foolish before. However, this time around the degradation of the zinc mining space through mine closures, lack of a pipeline of new projects (or even old mines to reopen) and virtually zero exploration since 2011 means that the landscape is not only parched it is veritably scorched earth. Zinc fell from about $0.90 per lb in the late ’80s to $0.40 per lb in 1993, then spent the rest of the decade constricted to a range between $0.40 and $0.55. After the Tech Crash in 2000, it sunk below $0.40 per lb until 2003 when it began to regain traction. In2004-5 it broke out above what appeared to be a multi-year $0.50/lb resistance and within two years quadrupled. In late 2006 it broke above $2 per lb. Now it is threatening to challenge the $1.10 per lb “ceiling” which has held it back in recent years. A breakthrough would be a significant event. Already though the truffle-hounds of the mining markets are off sniffing about for Zinc plays and they find little to their taste. Nevada Zinc Corporation (TSXV: NZN) though is an up and coming story which is starting to appear on the radars and we have published a research note on the exciting developments at the company (including its Yukon gold plays) and here we shall relay the main findings. Nevada Zinc’s 100% owned Lone Mountain project is located within close proximity to Eureka, Nevada with its 224 claims spread out over 20 square kilometres surrounding the historic Mountain View Zinc Mine. The concessions that the company holds consist of territory it claimed itself, further territory optioned from Bravada Gold and a quite recent purchase of the old Mountain View Mine and surrounding ground. Therefore the company has essentially consolidated the deposit and has accordingly expanded the territory it has drilled, most particularly in the latest season. Initial results (released a few weeks ago) showed some very healthy intercepts. The task now is some more infilling drilling to flesh all this out into a resource estimate. Old geological reports indicate that the first claims were located in the area in 1920 for zinc. Production was small until 1942 when high grade zinc carbonate was discovered on the Mountain View claim. An underground mine was established with levels on the 44-foot and 82-foot levels. Production in 1942-1943 totaled 2,284 short tons grading 28.8% zinc and 4% lead. Production from 1942 to 1964 amounted to 4,952,627 lbs of zinc, 649,579 lbs of lead, 4,040 ozs of silver and 600 lbs of copper. The mineralogy of the ore was reported to be smithsonite, zincite, hydrozincite and cerussite, malachite, and azurite. It was reported that small amounts of sulphide were present locally, principally, sphalerite, galena, chalcopyrite, and pyrite. A small drill program was reported to have been completed in areas proximal to the MVM property which indicated the presence of additional mineralization. In November of 2015 Nevada Zinc acquired historical data from exploration and mining work done in the past at the Mountain View mine. Closeology is all the buzz these days and it certainly helps, in the period just past when funding exploration was almost impossible for most juniors, that a well cashed up neighbour was doing significant work and what they did rebounded well onto neighbours. This is definitely the case for Nevada Zinc, which despite its name has held significant territory in the Yukon for quite a while now. On the practical pro-active side it has commenced work on its VIP property located just west of Kaminak Gold’s (now Goldcorp’s) Coffee project. In mid-May 2016, Goldcorp announced that it had agreed to purchase all of the issued and outstanding shares of Kaminak Gold in a deal valued at approximately $520mn. This deal energized the market for Yukon properties and had collateral benefits for neighbours and other Yukon explorers in general by reinforcing the attractiveness of the area to majors. Nevada Zinc has a swathe of properties adjoining (and seemingly along trend from) the hotly sought after Coffee project and also owns an NSR on an intermediate plot currently held by Independence Gold. It also owns other prospects in parts of the Yukon that are heating up. These are either held for its own exploration or in earn-out deals. We would not be surprised to see these monetized for shareholders in a Newco type spin-out once the Nevada properties have a resource and a bifurcation of interests starts to look the best way to reward shareholders and create two vehicles that can each monetise two hot trends in the current market i.e. Zinc plays and Yukon gold plays. The dearth of realistic Zinc projects that has evolved (devolved?) over the long grim years in which companies could not raise funds to advance projects (or even do basic exploration) has created a “scorched earth” scenario in the Zinc (and Lead) sub-space of the mining sector. This has set investors off on a hunt something like an Easter Egg Hunt, where there are actually few eggs to be found. We can number on the fingers of one hand the explorers that persevered with work on Zinc projects through this grim period and one of those was Nevada Zinc, which accrued its initial position at Lone Mountain and then added to it during 2014 and 2015. The reward for this perseverance has now come in it being one of the few projects in the US alternatives out there with a project likely to provide a flow of exploration results and developments. In a case of it never rains but it pours, the Yukon, where the company has its back-up exploration property (as well as holding an NSR on another and with yet another farmed out) has gone from quietly bubbling to searing hot in a matter of months with the Goldcorp takeover of Kaminak Gold electrifying the area and turning the focus onto the territory that Nevada Zinc has long held on the trend. This opens up the possibility that the company can capitalize on these in any number of ways including demerger (for us, the most desirable option) and/or sale of the Yukon assets. If things continue along in the current direction management and shareholders should be able to have their cake and eat it too. August 25, 2016 — Bruce Durham, President, CEO and Director, of Nevada Zinc Corp. (TSXV: NZN) in an interview with InvestorIntel Sr. Editor Fred Cowans discuss the +115 ercent plus rise in share price in 2016 already and their competitive “stage process” for acquiring projects. They also discuss the drill results from Nevada Zinc’s 100% owned Lone Mountain project in Nevada, which is very leachable and how they have already begun with some metallurgy and initial test work alongside the drilling process. Beijing has ordered the shutdown of all lead and zinc mines in parts of Hunan province, the centre of Chinese production. Teck Corp. "B" (TEK/B), HudBay Minerals (HBM), Lundin Mining (LUN), Nevsun Resources (NSU) and Trevali Mining (TV). AZ Mining (AZ), Canada Zinc Metals (CZX), Nevada Zinc (NZN), Canadian Zinc (CZN) and Tinka Resources (TK) to name a few. Zinc is the best performing base metal so far this year and measured from its multi-year low struck mid-January the zinc prize is up 54%. Zinc's prospects brightened considerably after the shutdown of two major mines last year – Australia's Century and the Lisheen mine in Ireland. The two mines had a combined output of more than 630,000. Top zinc producer Glencore has been out in front when it comes to curtailing production to shore up prices and the Swiss giants' announcement of cutbacks inspired another leg up in the price. The Swiss giant's first half production numbers released last week showed a 31% output decline to 506,000 tonnes after the company idled mines in Peru and downscaled its Australia operations. Now China, top consumer and producer of the metal mainly used to galvanize steel, could add fuel to the fire after news that Beijing has ordered the shutdown of all lead and zinc mines in parts of Hunan province, the centre of Chinese production. China is forecast to have a mined zinc deficit of 390,000 mt in 2016, widening from a deficit of 9,000 mt a year ago, state-owned Chinese metals consultancy Beijing Antaike said in its zinc sector report issued in end-June. Key to market psychology has been the concentrate market, which has tightened to the extent that treatment charges, fees paid by miners to smelters to process raw material into metal have tumbled towards $100 a tonne from above $200 in April 2015. Speculation has now turned to whether producers would bring mines back into production. In the half year report Glencore kept full year guidance on zinc production steady at lower levels. A table tucked away in the report gave an indication why. Despite zinc's huge run-up this year the average price in the first half is still 16% below the same period last year. Glencore may be looking for further evidence zinc has entered a new boom phase before switching on its considerable capacity. TORONTO, Aug 11, 2016 - Nevada Zinc Corporation ("Nevada Zinc" or the "Company") (NZN) is very pleased to report the assay results from eight reverse circulation drill holes recently completed on the Company's Lone Mountain zinc project ("the Project"). Drill hole LM16-56, at the Discovery Zone area, intersected a broad zone of mineralization commencing at a depth of 164.59 metres and continuing for a hole length of 100.58 metres (330 feet) that averaged 7.0% zinc+lead. This is the deepest test of the Discovery Zone to-date and the zone remains open to further expansion below this depth. Six of the eight holes were drilled to test for the presence of shallow, non-sulfide, zinc-lead mineralization in areas proximal to historic small-scale mine operations on the west side of the Mountain View Mine Property, situated within the boundaries of the Project. Most of the drill holes intersected significant zinc-lead mineralization at shallow depths associated with brecciated and fractured sedimentary rocks of the Devils Gate Formation. At a depth of only 6.1 metres from surface, drill hole LM-16-57 intersected 6.4% zinc+lead mineralization over a hole length of 47.24 metres (155 feet). Drill holes LM-57, 58 and 59 appear to have intersected historic workings or other near surface poorly consolidated material and therefore did not have complete sample recovery included in the zones of mineralization. Drilling to-date, between surface and 250 metres, has identified mineralization for more than 450 metres along the main trend from the west side of the Discovery Zone area to the east side of the Mountain View Mine Property. Drill hole LM-16-55 and 56 were drilled to test the northwesterly and down dip part on the Discovery Zone and the extremely broad zone of mineralization in drill hole LM-16-56 is the deepest test on the Discovery Zone to-date. The current drilling program is part of a work program designed to evaluate the potential of the Project to host near surface zinc-lead resources that could potentially be mined using low cost open pit mining techniques. The majority of the drill holes reported to-date from the Mountain View Mine Property and the Discovery Zone area of the Project have intersected near surface zinc-lead mineralization that is now known to extend from surface to a depth of approximately 250 metres beyond which it remains open to further expansion. President and CEO, Bruce Durham commented, "I am very pleased that drill hole assay results continue to confirm the presence of significant shallow zinc mineralization on the Mountain View Mine Property and that we have been able to extend the mineralization at the Discovery Zone area. Our next round of drilling will continue to target very near surface mineralization at the Mountain View Mine Property as well as well as deeper mineralization at the Discovery Zone area. For the remainder of August we will focus on various initiatives for a number of our Yukon based gold projects as we concurrently plan our next drill program at Lone Mountain which is to commence shortly." Drill Hole LM-16-56 intersected a 100.58 metre interval of mineralization with an average grade of 7.0% zinc+lead at a down hole depth of 164.6 metres. The first 15.24 metre (50 foot) interval within the broad mineralized zone assayed 20.24% zinc+lead. Drill Hole LM-16-57 drilled near the surface expression of the mineralization and proximal to the historic 'Extension Shaft' intersected mineralization commencing at a downhole depth of 6.1 metres that assayed 6.4% zinc+lead over a hole length of 47.24 metres (155 feet). In drill hole LM-16-57, nine sample intervals, each of 5 feet in length were not recovered for technical reasons in areas that are likely to have been mineralized. Intervals with no sample recovery were averaged into overall averages with zero grade. Similarly LM16-58 and 59 had several unrecovered sample intervals. The drill hole collar distribution for the holes in this release and this Phase 4 drill program span approximately 450 metres (see accompanying Plan Map). The zinc-lead target tested in the short drill holes on the Mountain View Mine Property is one of two or more zinc-lead zones in the area near historic small scale mining at the Mountain View Mine that was apparently focused on narrow high grade zinc rich fractures with the material hand sorted and direct shipped to a smelter for processing. The Company has done no testing of the zinc mineralized zones on the Mountain View Mine Property more than 100 metres below surface. All zinc-lead mineralization intersected to-date on the Project is non-sulphide in nature (principally hemimorphite) the style of mineralization that historically provided 80% of the world's zinc metal. The Company has completed initial studies showing the mineralization can be easily upgraded to the grade of a potentially shippable concentrate and as well the Company has completed studies showing this mineralization is easily dissolved using readily accessible sulphuric acid. While not definitive, the early studies are supportive of the idea that this mineralization can be processed using existing technology. Notes: True widths are not given as it is not possible to determine the true width of the various zones of mineralization at this time. Supervision and organization of the reverse circulation drilling chip samples was undertaken by Nevada Zinc personnel. Samples were collected at 1.52 metre intervals from a rotating wet splitter assembly attached to the drill rig. Chip tray samples were collected from the reject side of the wet splitter. The splitter was adjusted to produce 4.5-9.0 kgs. of sample. Samples were collected from the drill in cloth bags by employees of New Frontier Drilling under the Company's supervision. Samples were catalogued by Nevada Zinc's geologists and stored in a secure location. Certified reference standards were placed in the sample stream of each drill hole at random intervals. Blank material was also inserted at random intervals. Preparation of the samples was done at the ALS Chemex Elko, NV facility. A 250 gram master pulp was taken then splits were sent to ALS's North Vancouver, BC facility or their Reno, NV facility. A 48 element package using a 4 acid digestion with ICP-AES and ICP-MS was completed on all samples. For lead and zinc values exceeding the limits of the 48 element package (1% zinc or lead), the procedure was to use a 4 acid digestion with ICP-AES or AAS finish (ore grade analysis). In the case of values exceeding the limits of the ore grade analysis (30% zinc, 20% lead), the procedure was to use specialized titration methods. ALS's Reno, Elko, and North Vancouver locations all have ISO/IEC 17025:2005 accreditation. Teck, the world's third largest zinc miner provided a review of the zinc market in its shareholder day presentation (March 30, 2016):http://www.teck.com/investors/presentations-webcasts/teck-s-investor-and-analyst-day---march-30 slides 111-117. The slides clearly depict a looming, significant zinc deficit for many years to come due to growing demand for zinc offset by mine closures and a lack of new investment. While the Company maintains its highly prospective portfolio of Yukon gold properties and continues to advance them, the current focus of the Company is the exploration and advancement of the Project comprised of 224 claims covering approximately 4,000 acres near Eureka, Nevada. The Project is located in east-central Nevada and is easily accessible via paved and gravel roads northwesterly from Eureka where all essential services are available. The Project includes options, leases or purchase agreements to acquire 100% interests in all properties along the key structural trend for more than 3 kilometres.